Thomas Calabrese — Hue, (Pronounced Way) South Vietnam, February, 1968. The Battle of Hue (also called the Siege of Hue), was one of the bloodiest and longest battles of the Vietnam War. 11 battalions of the Army of the Republic of Vietnam (ARVN), four U.S. Army battalions, and three understrength U.S. Marine Corps battalions, for a total of 18 battalions, defeated 10 battalions of the People’s Army of Vietnam (PAVN or NVA) and the Viet Cong (VC). The beginning of the North Vietnamese Tet Offensive began on January 30, 1968, (the Vietnamese lunar New Year). Large conventional American forces had been stationed from the Mekong Delta to the DMZ for almost three years now. Highway 1 passed through Hue and was an important supply line for ARVN, US, and Allied Forces and it was strategically located between the coastal city of ĐaNang and the Demilitarized Zone. Hue also provided access to the Perfume River at the point where the river divided the city into northern and southern parts and was also a base for United States Navy supply boats. Considering its logistical value and its proximity to the DMZ (only 50 kilometers (31 mi)), Hue should have been fortified and prepared for any communist attack, but the city had few fortifications and was poorly defended. Corporal Spencer Matheson had been in country for only two months when his unit, Hotel Company 2nd Battalion, 5th Marines was sent to Hue. Combat was a new experience for the 19 year old Marine and fighting in an urban environment was a new experience for his entire Marine Unit. Spencer’s platoon was originally assigned to protect the airfield at Phu Bai and it was while he was there, the North Vietnamese and Viet Cong commenced simultaneous attacks on his position, the Truoi River Bridge and the Phu Loc sector. He was sent with a hundred other Marines to reinforce the detachment at the bridge that was on the verge of being captured by enemy forces. Spencer could hear gunfire coming from every direction when he arrived. The impromptu plan was to follow three M-48 tanks from the 3rd Tank Battalion across the bridge and neutralize the enemy’s positions. That was quickly dismissed when the tankers determined that the bridge wasn’t strong enough to support the weight. The ARVN’s had M-24 light tanks, but they refused to go, so that left it up to the infantry. A young Marine experiencing his first taste of battle is going to follow orders, not because he’s brave or patriotic, it is because he just doesn’t know what else to do, so he’ll walk into the gates of hell if he is told to. The machine gun opened fire when the Americans were halfway across the span and two Marines alongside Spencer immediately went down in a hail of bullets. A thought flashed through his mind about stopping to help them, but his training and instincts told him otherwise. He threw a grenade as far he could and it bounced up to the enemy’s position and it exploded. In a split second Spencer heaved another and this one landed right next to the machine gun and silenced it. “Take it easy,” Pfc Griffith said. “You too,” Spencer took off at a full sprint while weaving from left to the right to make himself a more difficult target. Bullets were hitting all around him and he saw muzzle flashes coming from a building about fifty yards to his left so he ran in that direction, crashed through the front door and shot three North Vietnamese soldiers. His adrenalin was pumping so fast that he had to visually check his body to make sure that he wasn’t wounded. From his vantage point, Spencer saw Marines taking heavy fire from numerous buildings. Not knowing what else to do, he moved to the next structure and shot another sniper. Spencer came across a rifle squad from the 1st Air Calvary Division and teamed up with them to clear several houses of enemy fighters. It was brutal fighting, sometimes as close as a few feet away and in a matter of minutes Spencer killed a dozen enemy fighters, but it seemed to have little effect on the incoming fire, it was as heavy as always. It was while he was with the Army that Spencer overheard a radio transmission that there was not going to be artillery or air support because of the historical and religious value of the city. This was the last thing that a grunt wanted to hear and if that wasn’t bad enough, the weather was growing worse. The Marines were hunkered down behind a wall when Spencer came rushing in and dived for cover just a few feet ahead of a burst of enemy machine gun fire. “I thought you were dead,” Staff Sergeant Brimley called out. “I got close a few times,” Spencer responded as he took off his helmet and ran a bloody hand through his sweat soaked hair. “Thanks, I did play a little baseball in high school, but back then I was wilder than a west Texas wind, I’m glad I found my strike zone this time,” Spencer shrugged. “You better catch some zzzzz’s, it’s going to get a hell of a lot worse before it gets better,” Sergeant Brimley surmised. A few dozen Marines slowly stirred from their various positions of uneasy sleep, the sound of gunfire and explosions were a stark reminder that their nightmares were indeed real. We move out at dawn…one more thing, I want every rifleman carrying at least six bandoliers (a bandolier is a belt with pockets for cartridges or magazines and M-16 bandoliers usually held seven magazines. )The Marines quickly complied with their orders while making small talk to avoid discussing their upcoming mission. “I don’t even know where the hell that I’m going to be at the end of this day,” Spencer commented. The Devildogs saddled up and started moving out, not far away the door to a reckoning was open and beckoned their arrival. 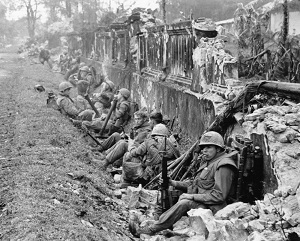 Once they got to the west wall of the Citadel, a North Vietnamese sapper team dressed in ARVN uniforms opened fire on the Marines, killed two and wounded four before Spencer and his fire team neutralized them. The cloud cover was too low for a medivac chopper so the dead and wounded were loaded onto wooden carts that were left behind by the South Vietnamese villagers and Marines pulled their comrades out of the line of fire. Spencer’s knees were pushed up to his chest and he could barely move either arm and for thirteen hours his body grew more numb with each passing minute. He was tempted to call out so that the NVA soldiers could end his misery. Then just when he didn’t think he could take it any longer, he heard the distinctive and reassuring sounds of M-16 rifles and M-60 machine guns growing ever louder. The Marines were counterattacking and the enemy machine gun was in position to kill a lot of good men. Since the NVA soldiers’ attention was diverted from his position, Spencer took this as his opportunity to shake some life into limbs. He struggled to put his M-16 in a position where the barrel protruded between two jagged pieces of stone wall. Spencer hoped that his aim was true because he couldn’t bend over to sight in on his target. He squeezed off a short burst and killed both machine gunners and slowly pulled the barrel back from view. When two more NVA took their place, he shot them as well. The other enemy soldiers assumed that an American sniper had locked in on their position so they hit the deck or scrambled for cover. This gave the advancing Marines precious minutes to make their assault. “Who said that?” Staff Sergeant asked as he scanned the area. “I did,” Spencer stuck several fingers out of the hole and wiggled them. “For the last thirteen or fourteen hours, I’ve been asking myself that same question,” Spencer replied. “Did you kill these guys?” Staff Sergeant Brimley pointed to the dead NVA soldiers. “Yeah why, were they friends of yours?” Spencer joked then grimaced as he tried to move his legs. When he tried to stand up; he wobbled and fell back down. “You need a corpsman to look at you,” Staff Sergeant Brimley observed. Later that day the Marines set up defensive positions next to a communication compound in Southern Hue, ten Marines were killed and 56 wounded during this latest battle. Spencer’s platoon had taken a lot of casualties, so he was now fighting with Marines that he barely knew. There is an old saying in combat; the enemy of my enemy is my brother and to Corporal Spencer Matheson, it was simple; if they were wearing a Marine uniform, he would die for them and they would die for him. By now Spencer was operating on instinct and training because the adrenalin rush of combat had been drowned out by days of physical fatigue and emotional exhaustion. The NVA forces launched a mortar attack on Camp Evans which caused an ammunition dump to explode, disabling most of the aircraft from the 229th Assault Helicopter Battalion. Other attacks along Highway 1 damaged or destroyed 20 bridges and 26 culverts between Hai Van Pass and Phu Bai. By the time the word got passed down that the Marines were preparing for a counter attack, Spencer had lost most of his friends and he was eager to inflict some serious retribution. Many of the other Marines saw it in a much different light; they knew that if it was this rough holding ground, then the price for taking it back would have to be paid in blood…buckets of it. “I ain’t qualified for that,” Spencer protested. “This isn’t a request, you lead and your men will follow,” Staff Sergeant said in no uncertain terms. Staff Sergeant Brimley quickly discounted the current plan of urban warfare and compiled a list of equipment and sent Spencer and a group of Marines to get it in any way possible. Several hours later they returned with four M-20 bazookas, three 106 recoilless rifles mounted on M274 mules, several boxes of C-4 explosives, two flamethrowers and six boxes of tear gas grenades. “Good job,” Sergeant Brimley said when he saw the arsenal. Spencer led two rifle platoons and after fierce fighting they retook portions of Hue University then continued their assault and eliminated enemy positions at the Catholic chapel at the Jeanne d’Arc High School. When they made it to the Treasury Complex, Spencer ordered his men to take a much needed and well deserved break. The dead were placed in one room, the badly wounded in another and the walking wounded, which was just about everybody else found a place to sit down, eat some chow and check their weapons. Epitaphs were written on the back of c-ration cartons and eulogies were filed away in the memories of these men and would be accessed years later in a different lifetime. The Marines were battered, bruised and beaten down, but they were unbowed and undefeated. “Same,” Staff Sergeant Brimley smiled. These two men did not need to comment on the obvious and their lack of conversation spoke volumes. On February 25, 1968 mopping up operations began in the area and when the numbers came in, they were staggering; ARVN losses were 452 killed and 2,123 wounded, while U.S. losses were 216 killed and 1,584 wounded. NVA losses are a matter of debate as the North Vietnam Department of Warfare gave figures of 2,400 killed and 3,000 wounded from 30 January until 28 March. A captured enemy document by the ARVN’s stated that 1,042 NVA troops had been killed in the city proper and several times that number had been wounded. The South Vietnamese government gave figures of 5,133 killed and 1,900 wounded during the battle. 4,856 civilians and captured South Vietnamese military personnel were either executed by the North Vietnamese or went missing during the battle. When the smoke had cleared and the American flag flew over every place that it had before the TET offensive, the North Vietnamese did not control one piece of ground in the city. Two warriors stood side by side in front of the badly damaged Citadel and surveyed the carnage and destruction in silence. Staff Sergeant Brimley swallowed his emotions and remained stoic. A phantom ray of sunshine pierced the ominous and impenetrable dark gray cloud cover and illuminated a single lonely teardrop as it fell from the eye of Corporal Spencer Matheson and rolled down his dirt streaked face. No matter how you spelled it, there was No Way that these two Marines and their brothers in arms were going to lose the Battle of Hue City. Great story…one of your best…exciting and touching. I was genuinely moved. The Vietnam War was the war that everyone wanted to forget…this story showed that somethings are worth remembering like, honor, courage and loyalty. Really enjoyed this story gave a historical bakground and was very realistic and a good read. I think I would prefer the bush fighting that we had in comparison to the fighting in the cities. Good story Tom. Tough and brutal fight…The Marines conducted themselves with honor. I always like the way that Tom puts in so many important details, keeps it and interesting and draws you into the story…Battle of Hue happened in 1968 and I felt like it could have been yesterday from reading this story. Excellent story Tom! I learned a lot about the battle too. My husband was a Marine in Vietnam, this story gave me a perspective of what men like him went through in the War. Tom, First time I was in Hue was 1963 with HMM-162 landed at the airstrip. Next was in 1969 driving between Camp Evans and Camp Eagle used to stop there for a beer. I Also went up to Quang Tre (sp) in my jeep. I had a OH-6 that myself and a W2 used for our personal taxi as nobody else knew how to fly it. Great story. really enjoyed. I like how you incorporated an unexpected bunker for Spenser from the rubble. Turner out be a key position that turned the tide.